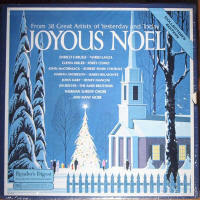 Readers Digest Christmas Album "Joyous Noel"
Produced by RCA custom products, catalog #RDA-57A released 1968. This 4 L.P. set was produced by RCA custom and included Enrico Caruso, Mario Lanza, Glenn Miller, Perry Como, John McCormick, Robert Shaw Chorale, Marian Anderson, Harry Belafonte, John Gary, Henry Mancini, Jim Reeves, The Ames Brothers, Norman Luboff Choir, and many more. This set is notable because it includes several selections from the early days of recorded music, like the big band era of the 1930s and even earlier! L.P. #1, side A: "Merry Christmas from the World's Great Pop Artists"
L.P. #,1 Side B: "Merry Christmas from the World's Great Pop Artists"
L.P. #2, Side A: "Merry Christmas from the World's Great Artists"
6- Ave Maria - Marian Anderson, Recorded 1936. L.P. #2, Side B: "Merry Christmas from the World's Great Artists"
3- Ave Maria - John McCormack & Fritz Kreisler, Recorded 1914. L.P. #3, Side A: "Yuletide Favorites of Yesterday and Today"
L.P. 3, Side B: "Yuletide Favorites of Yesterday and Today"
L.P. #4, Side A: "Merry Christmas from Golden Voices of the Past"
2- Nazareth - Richard Crooks, Recorded 1933. L.P. #4, Side B: "Christmas Fun"
Readers Digest albums | Goodyear Christmas Albums | Return to The Yulelights Collection.